China's State Internet Information Office will reportedly be allowed to conduct network security inspections of Apple products offered for sale in China as the company seeks to assuage fears that its devices can be used for intelligence gathering purposes by foreign governments. 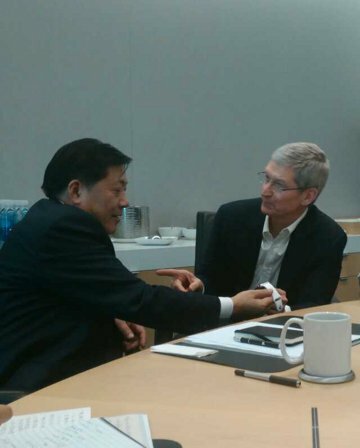 Apple CEO Tim Cook agreed to the inspections during a meeting with State Internet Information Office head Lu Wei last month in Cupertino, according to the Beijing News. The report was first noted by ZDNet. Cook is said to have assured Lu that while there were "rumors of us keeping backdoors and providing data to third parties," the company has "never had any backdoors and never will." Lu then told Cook that Apple's "products must pass the inspections done by our network safety officers," who will then "make conclusions and insure our customers." The exchange was recounted to the News by another Chinese official present during the meeting. Apple has been under fire in China for nearly a year following allegations of the company's complicity in spying by the National Security Agency. Apple has denied those charges, but the Chinese government has continued to paint the company in an unfavorable light. Last July, China Central Television called iOS location tracking "a national security concern." During the program, the state-owned broadcaster relayed information from Chinese researchers suggesting that the iPhone's "Frequent Locations" functionality could inadvertently reveal sensitive information, and "even state secrets." Shortly after that report, Apple began storing Chinese users' iCloud data in a datacenter within the People's Republic. In a statement to AppleInsider, the company noted that all data within that datacenter— operated by state-owned firm China Telecom— was encrypted, and that "China Telecom does not have access to the content." Then, in October, the Chinese government was implicated in a series of malicious attacks against iCloud users. The issue was so severe that Cook almost immediately traveled to China and met with Vice Premier Ma Kai, and the two are said to have discussed "protection of users' information," as well as "strengthening cooperation and in information and communication fields."